Exhibited: Royal Art Society of NSW, 1909 annual exhibition, number 91, 50 gns. Comments: Walter Gabriel exhibited oils at the RAS in 1906, 1908 and finally in 1909. These were mainly small sketches priced between 3 and 10 guineas. However, in 1906 his Washing Day was priced at 50 guineas as was Spring, exhibited in 1909, suggesting that these were his major works. 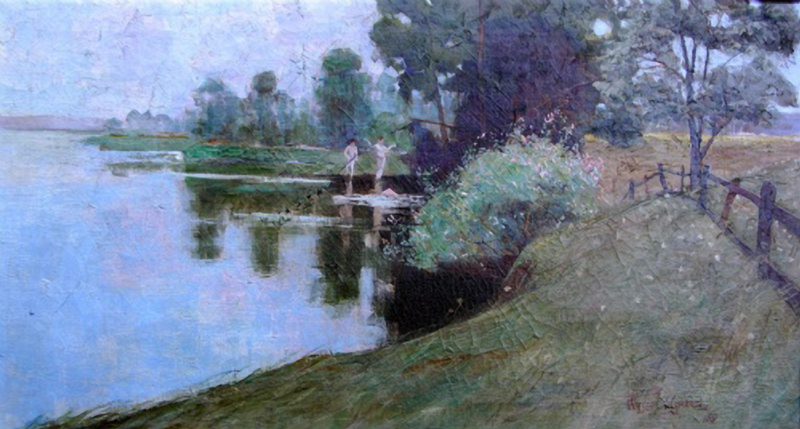 It is probable that Gabriel's Spring, which includes three boys bathing, was informed by similarly-proportioned works by Streeton and Roberts on the same theme. Roberts had painted The Sunny South c1890 (National Gallery of Victoria) which shows three young men, naked or semi-naked, on the beach at Mentone. At the same time Streeton painted Evening with Bathers (NGV) and Spring (NGV) which shows boys bathing at a bend in the Yarra. Streeton's Spring was shown in Sydney at 'Streeton's Sydney Sunshine Exhibition', 88 Elizabeth Street in November 1896. From titles of other works by Gabriel it appears that he worked mainly in NSW. Sid Long had painted By Tranquil Waters (Art Gallery of NSW) in 1894 which is similar in size as well as subject. Should more biographical information emerge it will be interesting to see if there is a firmer connection between Gabriel and these artists.